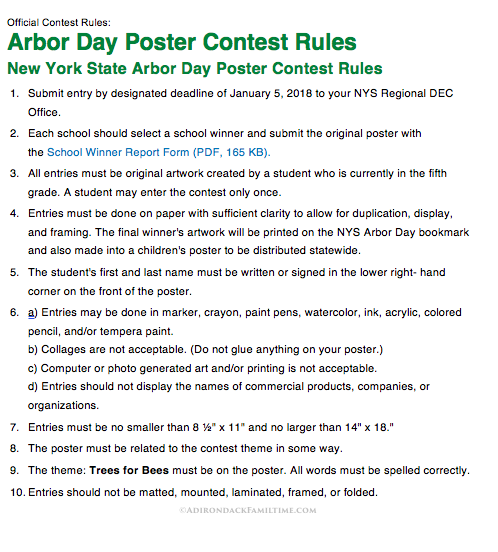 The New York State Department of Environmental Conservation (DEC) is now accepting submissions for the 9th annual 5th Grade Arbor Day Poster Contest. 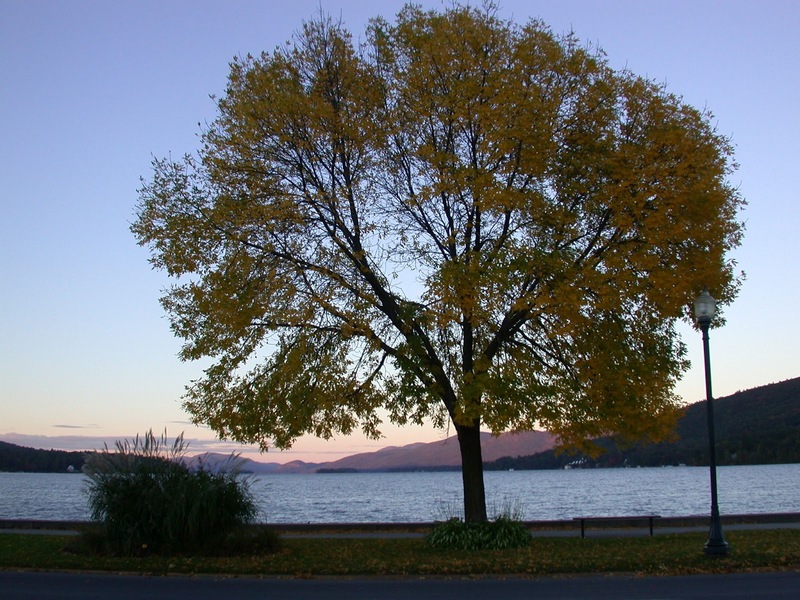 Students can showcase their artistic talents and help increase public awareness about trees in New York by participating in the contest. "Trees play a vital role in the lives of New Yorkers and are an important part of our ecosystem," Commissioner Basil Seggos said. "Whether someone is tapping a maple tree in early spring or relaxing in the shade of a tree on a hot summer day, trees are integral to our quality of life. I encourage New York's fifth graders to join our celebration of trees and showcase why trees are important in our daily lives." The annual 5th Grade Arbor Day Poster Contest is sponsored by DEC, the State Department of Agriculture and Markets, and the State Education Department. The theme for this year's contest is, "Trees for Bees." Students are asked to create an original poster depicting this theme. 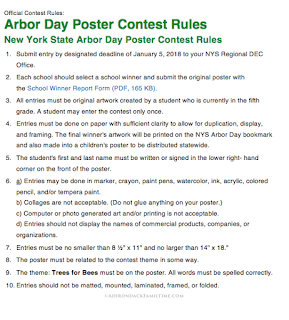 The winner will have his or her artwork replicated as DEC's official 2018 New York State 5th Grade Arbor Day Poster and the winning poster will be presented at the annual Arbor Day Celebration in Albany. Last year, New York printed more than 200,000 Arbor Day posters for distribution at schools, libraries, government offices, nursery and landscaping businesses, and environmental organizations throughout the state. 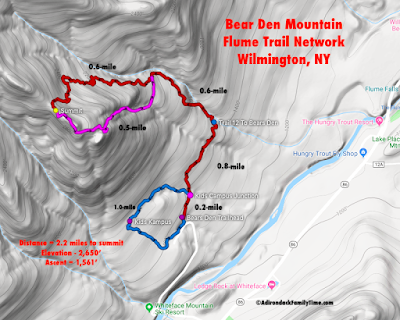 Posters must be submitted by January 5, 2018, to any local DEC regional office. The contest is open to all New York students enrolled in fifth grade. For more information, please contact Mary Martin, DEC Arbor Day 5th Grade Poster Contest coordinator, at (518) 402-9428, or visit 5th Grade Arbor Day Poster Contest on DEC's website.